Kinston was filled with excitement in October 1916. The entire community and surrounding areas were looking forward to the arrival of the 101 Ranch Wild West Show that was coming to town. It was to be an outdoor extravaganza that dramatized some of the most picturesque elements of frontier life. The show had been an enormous success, touring the country for three decades and playing to enthusiastic crowds across America and Europe. The railroad was even having a special train run from Snow Hill to Kinston to bring the crowds into town for the show. The sheriff ordered his deputies to make sure once the wild west show arrived, that beggars and con men were to be removed from the public streets, so as not to be bothersome to the town’s visitors that were coming to see the show. Many families opened their homes for out-of-towners to rent rooms for an overnight stay. Excitement grew with great expectation and anticipation when the wild west show rolled into town on the railroad. There were three trains with special designed cars carrying over 1,000 men, women, horses, wagons, equipment and supplies. More than 100 Indians were led by Sioux Chief Iron Tail, who was famous for his profile being on the Indian Head nickel. Even if this was held today, it would be an awesome sight to behold. It was exhilarating for the residents of Kinston to witness the arrival and unloading of the horses, equipment and supplies for the show. The 101 Ranch Wild West Show was complete with cattle, buffaloes, cowboys and Indians. It also included an all-around crowd-pleaser — the attack on the stagecoach. But it also contained elements of the circus with sideshows. For the first time the “Pageant of Preparedness," a World War I recruitment show, was featured. 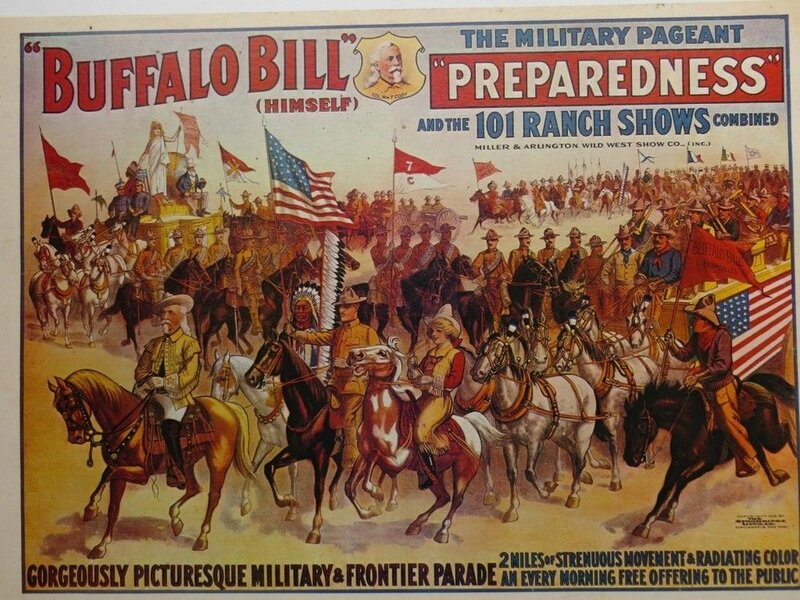 The U.S. Army sanctioned the Wild West Show and had a recruiting tent open on the grounds to receive enlistments for immediate service on the Mexican border. The show had batteries of field guns, charging cavalry, a gun drill by an artillery squad and a mimic border fight. This was the idea of Col. William F. Cody, the star of the show. An added attraction were Cossacks and Arabs providing an unusual sight that had never been seen before in Kinston. The following morning the streets were lined with people of the town and those who had come from near and far. At 10:30, the Wild West Show’s 2-mile-long parade began. A huge troop of performers, wagons and horses paraded through the wide streets of Kinston to the approval and amazement of all present. Following the parade later that day were shows at 2:30 and again at 8:30 that night. The Wild West Show performed at the fairground, near what is Fairfield Park today. The crowds filled the fairground where they were entertained with thrilling stunts by clever riders, acts of well-trained horses, dashing ensembles of cowboys, cowgirls, vaqueros, soldiers and Indians, all in their proper grabs and such other things as are usual in the average wild west show. There was the customary stage holdup, along with fights between Indians and ranchers. It was all spectacular and accompanied by glorious display of gunpowder. Rope-throwing, clever trick shooting and some excellent horsemanship filled in the moments between the big acts. Several fledgling entertainers that performed with 101 Wild West Show in 1916 were later to become stars in silent movies. They included Will Rogers, Tom Mix, Jack Hoxie, Mabel Normand and Buck Jones; some were likely in Kinston during the show’s performance on Oct. 16, 1916. The show proved to be half-circus and half-history lesson, mixing sentimentality with sensationalism. The one sight that no one would ever forget was the star of the show, an old gentleman that was well past his 80th milestone. He sat as erect in his saddle and looked as dashing a figure as he ever had. He was Col. William F. Cody, known to millions around the world as Buffalo Bill. Buffalo Bill, who once walked the streets of Kinston, seemed to enjoy his visit. He spoke of people he met as his “Kinston friends." He said Kinston had the best streets in the United States because they were nice and wide for his parade. About three months later he died in his beloved home in Colorado. Cody had come to embody the spirit of the Old West. He had been a messenger and wrangled for a freight company, a pony express rider, prospector, buffalo hunter to feed the construction crews of the Kansas Pacific Railroad, Army Scout and dispatch carrier, tour guide escorting rich Easterners and European nobility on Western hunting expeditions, actor, writer and showman. Many stories were written about him and as the tales grew over the years, Buffalo Bill Cody became a legend and one of the most famous men of his time. He was a man with a reputation for adventure, skill and bravery. For his service over the years as an army scout, fighting in 16 battles, he was awarded the Congressional Medal of Honor in 1872, although this award was revoked in 1916 claiming Cody was not a regular member of the armed forces at the time. The award was restored in 1989.